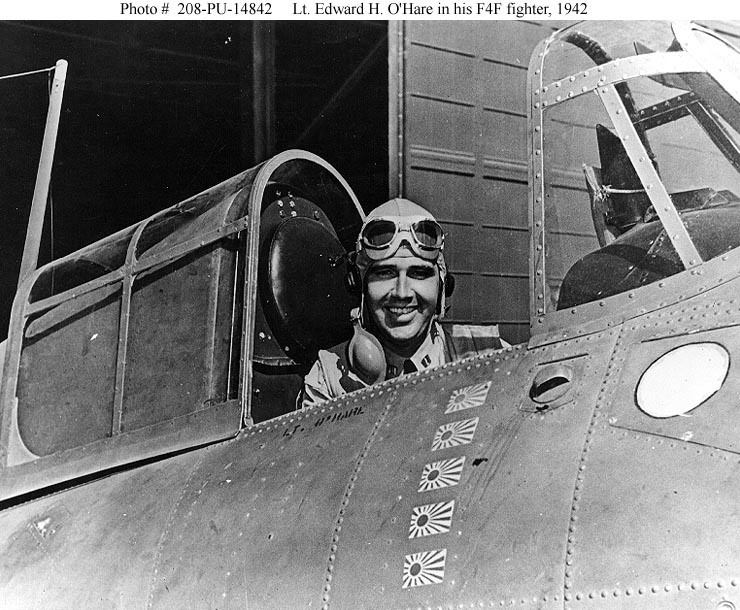 US People--O'Hare, Edward H., Lieutenant Commander, USN. Edward Henry O'Hare was born on 13 March 1914 in St. Louis, Missouri. Appointed to the Naval Academy from that state, he was commissioned an Ensign upon graduation in June 1937. For his first duty, he served in the battleship New Mexico. 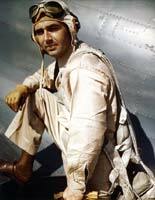 Designated a Naval Aviator in May 1940, after flight training at Naval Air Station, Pensacola, Florida, he was ordered to Fighter Squadron Three (VF-3) on board USS Saratoga. In June, O'Hare was promoted to Lieutenant Junior Grade. In early 1941, while Saratoga underwent maintenance, the squadron temporarily transferred to USS Enterprise. In September, VF-3 departed for duty with Saratoga in the Pacific. In January 1942, after that carrier was struck by a Japanese torpedo off Hawaii, the squadron relocated to USS Lexington. During this time, O'Hare was temporarily promoted to Lieutenant. 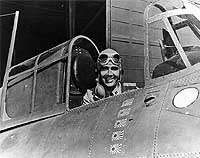 On 20 February 1942, while defending Lexington in a F4F "Wildcat" fighter, O'Hare encountered an advancing formation of nine Japanese bombers east of the enemy base at Rabaul, New Britain. Alone and unaided, he repeatedly attacked the enemy aircraft and was credited with shooting down five of them, and damaging a sixth, before they reached their intended target. For his "conspicuous gallantry and intrepidity" on this occasion, O'Hare was meritoriously promoted to Lieutenant Commander in April 1942 and was awarded the Medal of Honor. Returning to the U.S., he embarked on several war bond tours throughout the country. 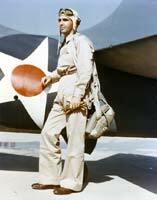 In June, he assumed command of Fighting Squadron Three (VF-3) and served at Maui, Hawaii, instructing pilots in combat tactics. In mid-1943, O'Hare commanded Fighting Squadron Six (VF-6), flying F6F "Hellcat" fighters from the aircraft carrier Independence during raids against Japanese bases in the central Pacific. In November, as Air Group Six commander on USS Enterprise, O'Hare participated in the Gilbert Islands invasion. On 26 November 1943, O'Hare volunteered to lead a night interception mission against enemy aircraft attacking his task group. 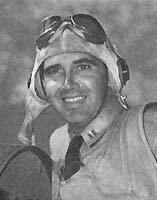 His plane was apparently shot down in the ensuing aerial battle, and Lieutenant Commander O'Hare was lost. In memory of the fallen aviator, Chicago's Orchard Depot Airport was renamed O'Hare International Airport in September 1949. Edward H. O'Hare is listed on the "Wall of the Missing" at the National Memorial Cemetery of the Pacific at Honolulu, Hawaii. USS O'Hare (DD/DDR-889), 1945-1973, was named in honor of Lieutenant Commander Edward H. O'Hare. This page features the only images we have concerning Edward H. ("Butch") O'Hare. If you want higher resolution reproductions than the "Online Library's" digital images, see: "How to Obtain Photographic Reproductions." 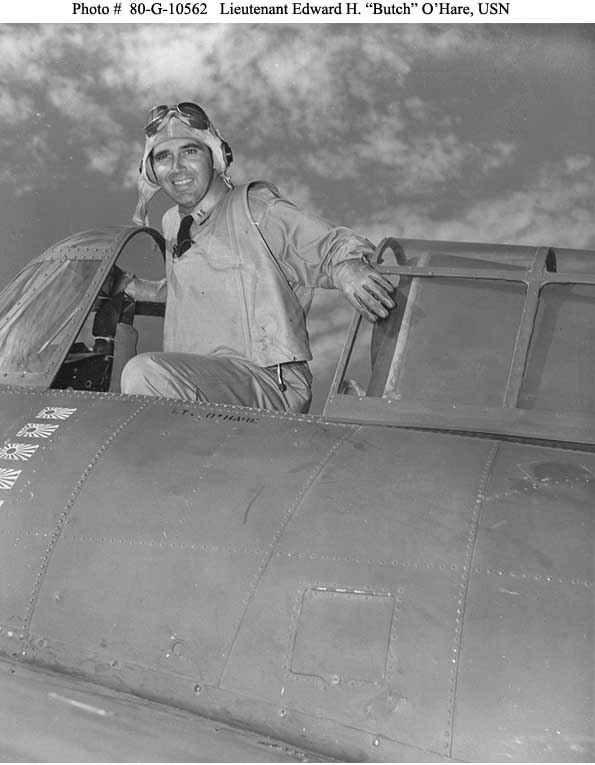 View taken on 10 April 1942 at Naval Air Station, Maui, Hawaii in the cockpit of his Grumman F4F-3 Wildcat Fighter. He was awarded the Medal of Honor for shooting down five Japanese planes on 20 February 1942, while he was defending USS Lexington during an attempted a raid on the enemy base Rabaul. Halftone reproduction of a photograph, copied from the official publication "Medal of Honor, 1861-1949, The Navy", page 232. 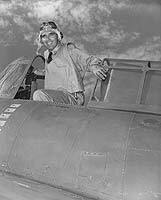 Edward H. O'Hare was awarded the Medal of Honor for "conspicuous gallantry and intrepidity in aerial combat" while serving as Section Leader and Pilot of Fighting Squadron Three (VF-3) in action against the Japanese off Bougainville, 20 February 1942. Seated in the cockpit of his Grumman F4F "Wildcat" fighter, circa spring 1942. The plane is marked with five Japanese flags, representing the five enemy bombers he was credited with shooting down as they attempted to attack USS Lexington (CV-2) northeast of the Solomon Islands on 20 February 1942. The censor has blanked out the Fighting Squadron Three "Felix the Cat" insignia below the windshield. Photograph from the Office of War Information collection in the U.S. National Archives. 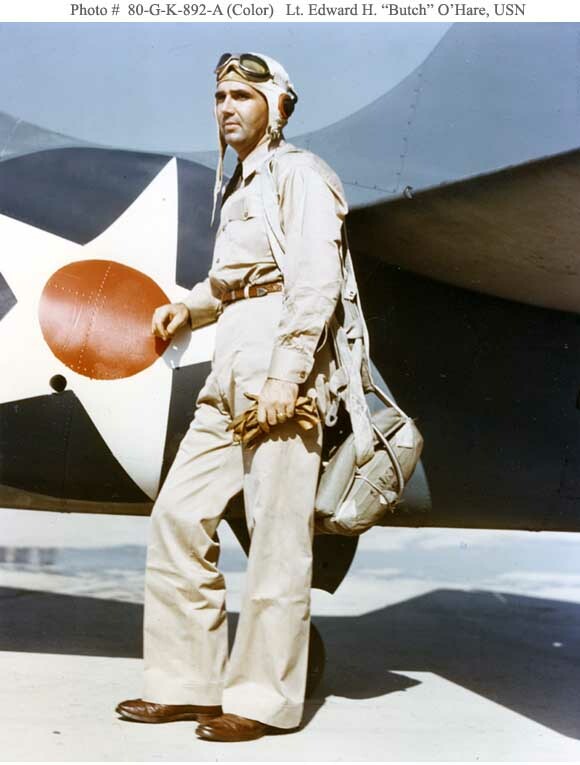 Stands by the tail of an F4F "Wildcat" fighter, circa April-May 1942. 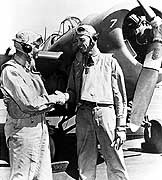 Stands beside an F4F "Wildcat", circa April-May 1942. Beside an F4F "Wildcat" fighter, probably circa April-May 1942. USS O'Hare (DD-889) was named in his honor. 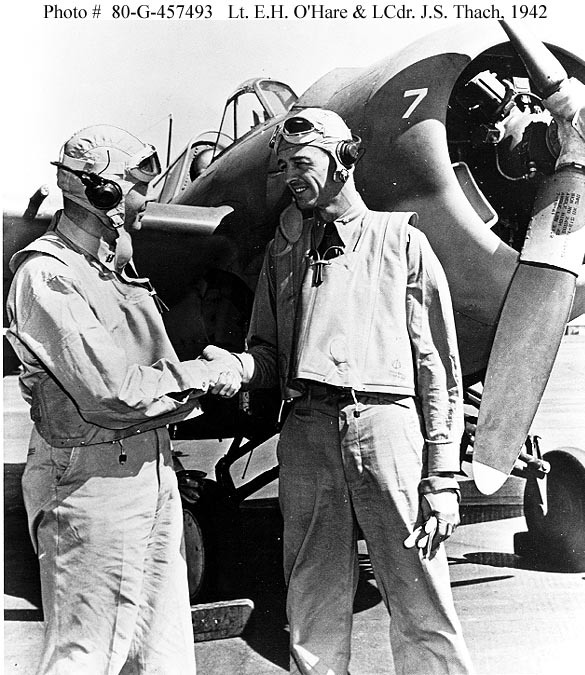 Shaking hands in front of a Grumman F4F "Wildcat" fighter plane at an Oahu air base, circa April-May 1942. Both men were assigned to Fighting Squadron Three (VF-3), of which Thach was Commanding Officer. Official U.S. Navy Photograph, now in the collections of the U.S. National Archives. In flight near Naval Air Station, Kaneohe, Oahu, Hawaii, 10 April 1942. The planes are Bureau # 3976 (marked "F-1), flown by VF-3 Commanding Officer Lieutenant Commander John S. Thach, and Bureau # 3986, flown by Lieutenant Edward H. O'Hare. 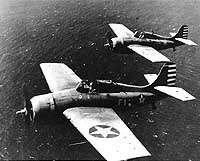 Both of these aircraft were lost while assigned to Fighting Squadron Two (VF-2) with USS Lexington (CV-2), during the Battle of Coral Sea in May 1942. Photographed by Photographer Second Class H.S. Fawcett. "For conspicuous gallantry and intrepidity in aerial combat, at grave risk of his life above and beyond the call of duty, as Section Leader and Pilot of Fighting Squadron THREE, on 20 February 1942. 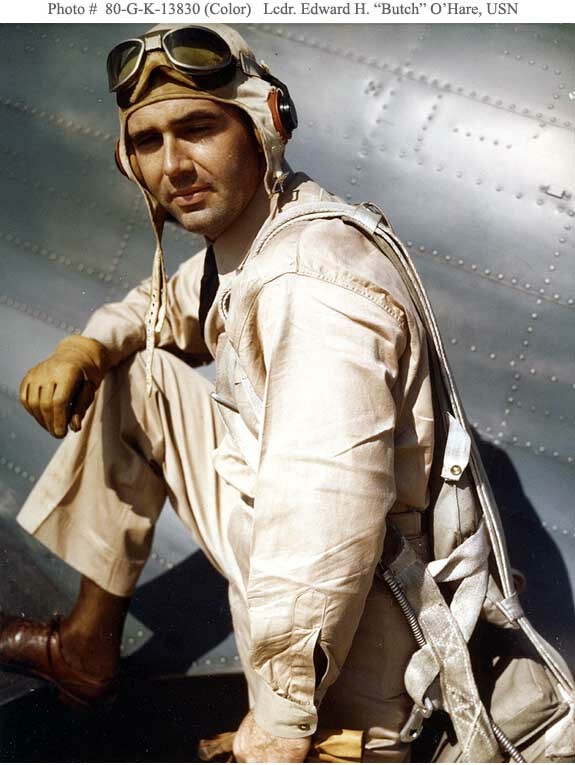 Having lost the assistance of his teammates, Lieutenant O' Hare interposed his plane between his ship and an advancing enemy formation of nine attacking twin-engine heavy bombers. Without hesitation, alone and unaided, he repeatedly attacked this enemy formation, at close range in the face of intense combined machine-gun and cannon fire. Despite this concentrated opposition, Lieutenant O'Hare, by his gallant and courageous action, his extremely skillful marksmanship in making the most of every shot of his limited amount of ammunition, shot down five enemy bombers and severely damaged a sixth before they reached the bomb release point. 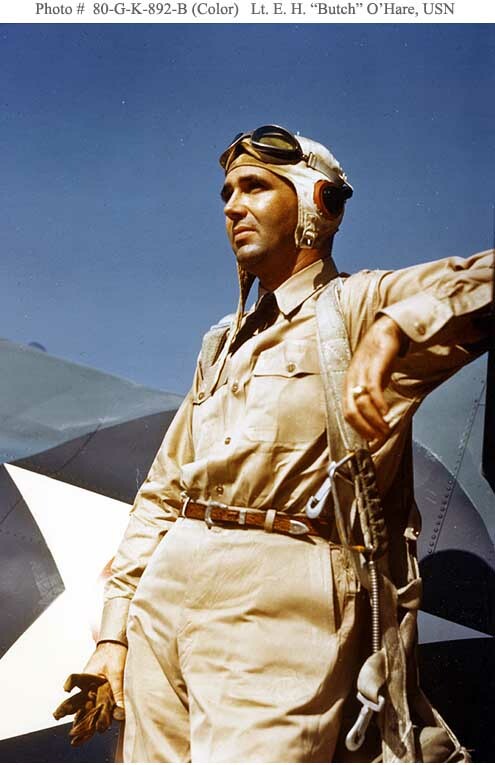 As a result of his gallant action--one of the most daring, if not the most daring, single action in the history of combat aviation--he undoubtedly saved his carrier from serious damage."